The Mets have agreed to a deal with free-agent righty Neil Ramirez, per Ken Rosenthal of FOX Sports (via Twitter). Ramirez, who just hit the open market after rejecting an outright assignment, will receive a major league pact. Ramirez, 27, opened the season with the Giants before being claimed off waivers by the Blue Jays. He was designated and outrighted before seeing any action with Toronto, though, and just went unclaimed the second time through the wire. New York will need to place Ramirez on its active roster, as he’s out of minor league options and thus cannot be sent down without first clearing waivers. The club will evidently be banking on Ramirez’s peripherals turning around his results. He gave up 15 earned runs in 10 1/3 innings with San Francisco, but also managed an 18:4 K/BB ratio with a strong 12.6% swinging-strike rate while dealing with some clear evidence of bad luck (.500 BABIP; 33.0% strand rate). The right-hander once looked like a potential long-term piece in the Cubs’ bullpen after coming over from the Rangers organization as a PTBNL in the Matt Garza trade, but shoulder and triceps injuries have slowed his career. Man, Ramirez would be a MUCH better LH option than Ian Krol. Why would they let him get by? 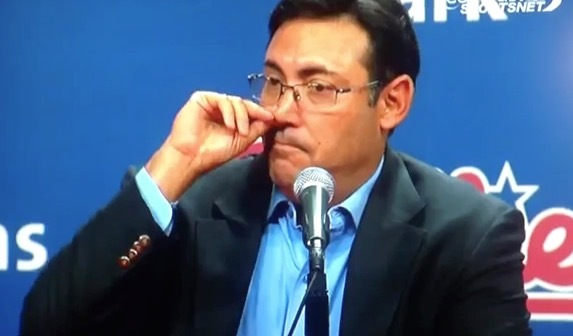 So they move Familia to the 60-Day DL or do Goeddel or Smoker get DFA’d? They wouldn’t give up on Smoker just yet, so I think he’s safe. I really don’t understand this signing though. His numbers are even worse than who they’re throwing out there each game to get lit up. Why this signing, one asks? I would think they’d move Familia to the 60-day DL. In the unlikely event that he’s able to pitch again this season, it wouldn’t be until months from now. Wait til you seen him pitch before drawing your conclusion. He could be a candidate to release before he month is up. Mets’ fans are all praying today. Will it be a Dark Knight? I actually hope Harvey turns it around. Though I have no respect for the Mets owners and management, I’m rooting for him to turn a new chapter. Otherwise the Mets overuse cost him his career and his family’s long term security.